Last year, I found out that Jona Giammalva was writing a book, I didn't know what the subject was but I knew that I would own it, I love her patterns for children, her blog, and I still miss her online shop. Finally, it was released earlier this year and I could not wait to get my hands on it. An adult skirt book! Yes! I sat in on Jona's schoolhouse to show support, here she is telling us how fabulous she is. Sadly, I didn't get the teary-eyed picture of her while she read a letter from a lady who wrote her and said that she was so happy to install an invisible zipper without any problems, it was sweet. All of those skirts in the picture above are versions from The Essential A-Line. She explained that an a-line skirt is flattering on most everyone, she probably said "everyone" but, I don't want to hear it if you don't like it on yourself. Most of the skirts on the wall are made with quilting cottons, which is perfect for spring and summer, the skirts are lined, they are finished nicely. There's one skirt in the book for pregnant ladies! Jona signed my book while we took a small break. Well, the next week, I came home and whipped up a skirt in no time! My skirt is the basic version, I used a linen (by Anna Maria Horner) for the main fabric, it has batiste lining and a red invisible zipper, I love it. I have washed fabric to make more skirts, but I am not able to sew much right now with prepping the studio for operation and summer with aforementioned six year old. Well, in that schoolhouse, I WON A BOOK, how about that? I asked Jona to sign that one, too so I could share with a lucky reader that is interested in making one of her skirts. So, here's your chance, five people that read this blog! Leave a reply in the comments telling me if you have made clothes for yourself before (what's your favorite pattern?) or if you want to take the plunge soon. You can tell me anything else that you want. Because of outrageous postage prices, this giveaway is for the United States only, please. I will pick a winner on Tuesday, July 2, 2013. If you don't want to wait to get your book, Sew, Mama, Sew has them. Support that little shop! Ooooh, that skirt looks great on you. I used to make clothes for myself all the time. And then I had children. Patterns didn't fit me anymore - until the Washi dress pattern. I'd love to give some skirts a try! Oh that linen as a skirt!!! I am totally copying your skirt. Totally. In answer to your question, I've sewn a few things for myself but I still consider myself a beginner. 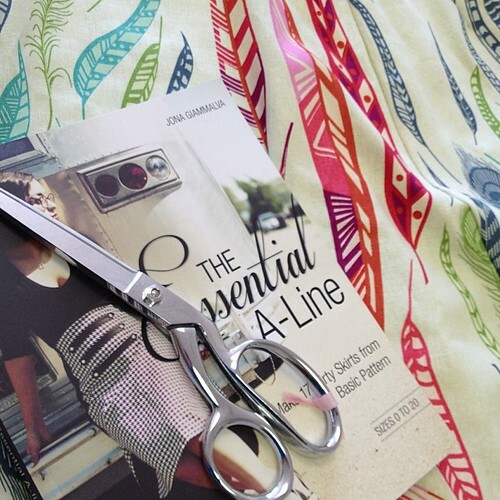 I love Colette and Sewaholic patterns! But I do like making skirts. A few years ago, 2006-2007ish maybe, I found a pattern for recycling jeans and cargo pants by turning them into skirts. I did this for my kids. And this year because I finally succumbed to the leggings craze, I've decided that I actually do like wearing skirts and I *cross my heart* had been thinking earnestly about taking out my sewing machine and making skirts, or asking a seamstress I know to do it for me/pay her for it. I may actually consider doing more of those jean skirts for the kids now that I'm thinking about it. Maybe something for myself, but out of light knit fabrics. I have a skirt I really like that I'd want to have in different colors. Not real sure what the pattern is tho. Anyway the pattern for pants into skirts more or less went like this. You can also use other fabrics to make a multicolored jean skirt with panels. I did that for some of the kids' skirts back when I'd made a few. I've made some dresses & pants for my baby, but nothing for myself! Love it! Dang, lately I've made clothes for myself by sticking my tongue out just right, closing one eye and hoping things turn out ok...in other words, without patterns ;) I have, however, made some for others out of some old patterns from the thirties lately! 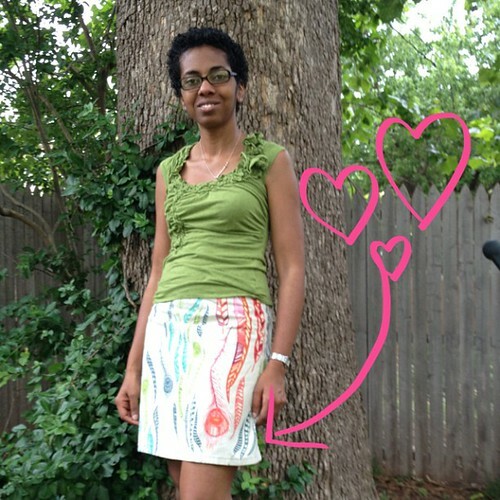 Love your skirt, and all the cute things you sew! When I was your age I made almost all of my clothes. Sometimes I'd wear something new five days a week! Don't need the book as I no longer sew for myself, but just wanted to chime in as one of your more-than-five readers. I haven't sewn any clothes for myself since High School. During my NYC trip a few weeks ago, I saw tons of cute sundresses hanging in the display windows of cute little boutiques in Soho. I commented to Aaron about how once I finally have a waist again I really need to work on my adult apparel skills. This book looks like a good place to start! WAAAAAY back, like in High School and later in college, I sewed for myself. It's been almost... well a lot of years. I should get back into it. I LOVE A line skirts for myself because they actually fit my waist and hips. Those are not easy parts to fit! I have been stocking up on fabrics to use for clothes as soon as I'm back to normal :). I've tried looking for maternity patterns but here isn't a whole lot out there right now! Your akiet looks great, btw! i like the skirt but i really love your top--did you make that one too? i sew almost all of my clothes and thrift the rest. not that i've had any time lately. Cute skirt! I have sewn plenty of clothing in my day, but lately my favorite is the Tova by Wiksten! I've never made any clothes for myself. I would love this book to help make the plunge. I'm a beginner with garment sewing. I've sewn several Sew Liberated School House tunics, several Amy Butler Cabo Halter tops, and now the Made By Rae Washi Dress. I'm a pear shape so A line skirts are ideal. 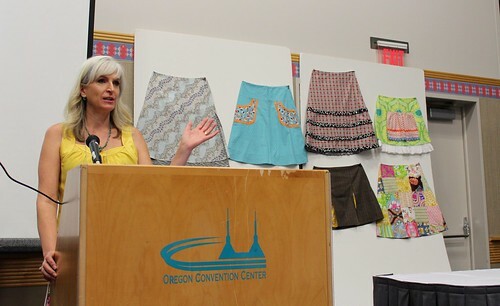 Love the Anna Maria Horner fabric used for your skirt! I starting sewing purses when your blog told me to. I started sewing washi dresses when your blog told me to. I guess I'll go for skirts now. I love that and you will love the skirts. Ooh, Shari, one day I will make that tunic! I have been building a stash of voile for tops and dresses. Thank you! Tova is on my list! No, my top is from Anthropologie, I bought it years ago. Haha! Quit pretending that I am smaller than you. 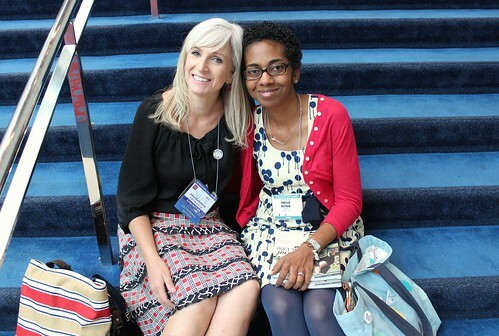 Uh, hello, there is a maternity skirt in the book! Ha! Yes, how cute would it be to sew a skirt for you and a dress for little C! Thank you for the love, Terri!